While offering condolences and prayers for the Pinckney family and the families of the other eight men and women who were heartlessly murdered in Charleston, SC, the truth needs to be told regarding Senator Pinckney's voting record in the SC Senate. 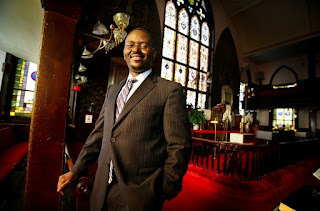 Whatever SC State Senator, Pastor, Clementa Pinckney, did for "the least of these" who were already born, he did not apply the well-known admonition of the Word of God in Micah 6:8, which Senator Pinckney himself reportedly quoted in the SC State Senate chamber, "to do justly", to the innocent, voiceless unborn in the wombs of their mothers. Senator Pinckney did not work for, but rather voted against, Establishing Justice for "the least of these" innocent, voiceless unborn children who are murdered in the wombs of their mothers. 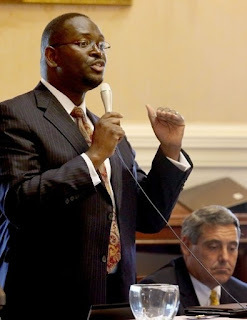 SC State Senator, Pastor, Clementa Pinckney was decidedly Pro-"Abortion" in the exercise of his power and authority as a South Carolina State Senator, voting against not only principled Personhood legislation, but even speaking and voting against weak "abortion regulation" legislation which those who work to incrementally regulate child-murder-by-"abortion" favor. 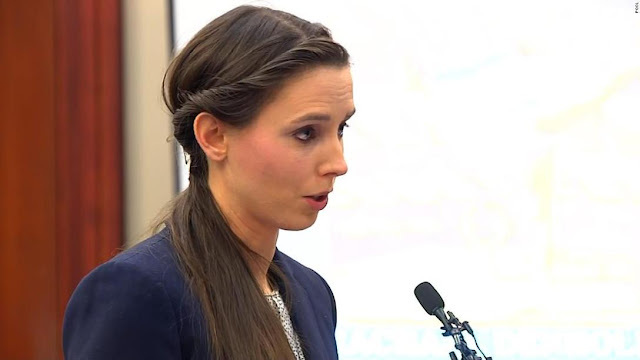 Senator Pinckney did not vote against such incremental, "abortion regulation" legislation because it did not uphold the sanctity of life ( which is the correct reason to vote against such un-Biblical measures ), but because for him even such incremental measures were too anti-"abortion" ( i.e., too pro-life ! ). 2) April 13, 2010 vote against principled Personhood legislation, voting to table the Recall Motion offered by Senator Lee Bright to pull the Personhood Bill ( S.450) bill out of the Senate Judiciary Committee where it was blocked by former SC State Senator ( from Charleston ) Glenn McConnell. Senator Clementa Pinckney is shown on the Senate floor in this 2014 file photo. The Rev. 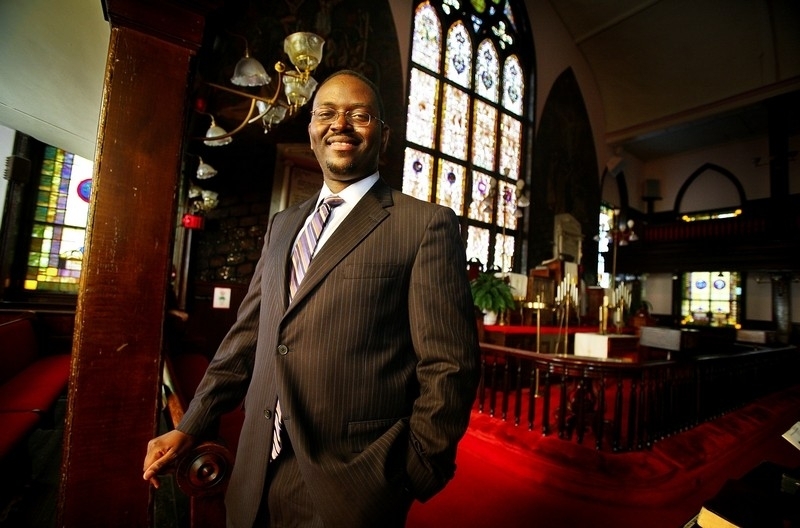 [ sic - Psalm 111:9, KJV ] Clementa Pinckney, the pastor at Emanuel AME Church and a state senator, was among those killed in the mass shooting Wednesday night in Charleston, clergy and fellow lawmakers say. Darby, along with other ministers, will be leading a special service for the victims, today at Morris Brown AME Church, just blocks from Emanuel AME. In a letter to AME churches and pastors, Darby also confirmed that Pinckney was among those killed. Pinckney, 41, is married and has two children. He was a Democratic member of the S.C. Senate. A black mourning cloth has been draped over Pinckney’s seat in the Senate chamber, according to reports from the Statehouse. © 2015, The Post and Courier, an Evening Post Industries company. 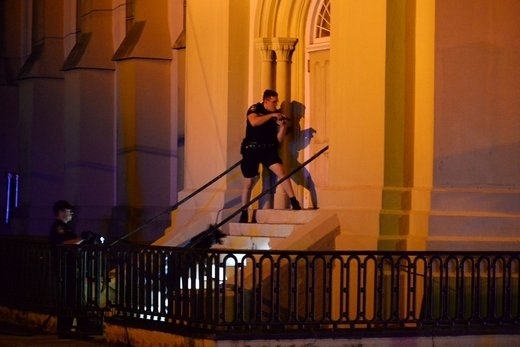 Nine people were shot, some fatally, inside one of Charleston’s oldest and most well known black churches tonight. A bomb threat complicated the investigation and prompted police to ask nearby residents to evacuate. Reporters and other onlookers huddled at the scene awaiting details on what could prove to be one of the worst mass shootings in South Carolina history. Mayor Joe Riley confirmed there were fatalities. Riley said city police were being assisted by sheriff’s deputies, the State Law Enforcement Division and the FBI. Police and emergency vehicles swarmed several blocks surrounding Henrietta and Calhoun streets, just east of Marion Square. Barricades blocked off several streets to traffic, and police asked nearby residents to leave their homes. The shooting occurred around 9 p.m. inside Emanuel AME Church at 110 Calhoun St. Police were seen exiting the 19th century church, and their presence extended blocks beyond the site. Police were still looking for the gunman late Wednesday, and helicopters are hovering above. Police spokesman Charles Francis described the suspect as a 21-year-old white male in a gray sweatshirt/hoodie and jeans with Timberland boots. He has a slender build. Kimpson is the Democratic colleague of Sen. Clementa Pinckney, who is the church’s pastor and was believed to be inside during the shooting. Kimpson said he is praying for Pinckney and for “our Mother Emanuel AME church,” as it’s affectionately called by many parishioners. It is the South’s oldest black congregation south of Baltimore. 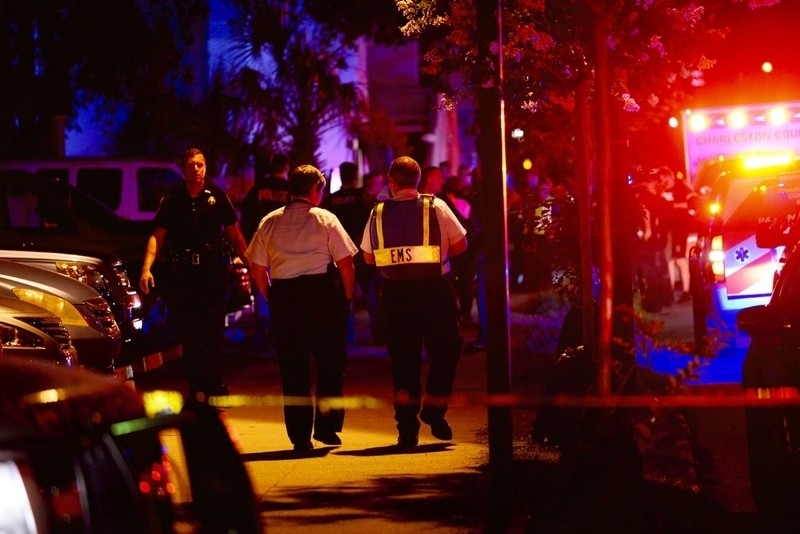 “I ask the nation to keep Charleston in our prayers,” he said. Police are looking everywhere in groups on Henrietta Street, in trash cans and under cars. Henrietta runs behind the church, just north of Calhoun. A huge police and ambulance presence exists with officers wearing bullet-proof vests and carrying guns. Officials have told people to go indoors or drive away from the area, and several police cars are present on the streets several blocks from the church. Pinckney was in Columbia earlier in the day for the Legislature’s continued session but returned to Charleston and was in the church for a service at the time of the shooting, a Statehouse Democratic caucus member said. Pinckney, 41, was elected to the S.C. House of Representatives in 1996 at the age of 23. In 2000, he was elected to the state Senate at 27. His Senate district includes southern Charleston County and parts of Jasper, Beaufort, Colleton, and Hampton counties. The [ sic - Psalm 111:9, KJV ] Rev. Joe Darby, former longtime pastor of Morris Brown AME several blocks away, was at his Charleston home when he heard the news. He rushed to the Embassy Suites Hotel around the corner from the shooting to join fellow church members in his district. Darby now is presiding elder of the 33 churches in the AME Church’s Beaufort District. The church’s history, so interwoven with Charleston’s, begins around 1816 when Morris Brown, a free shoemaker and devout Methodist, walked out of a predominantly white and racially segregated Methodist Church in Charleston. 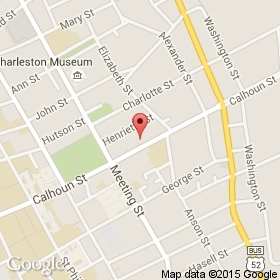 Brown formed the African Methodist Episcopal Church of Charleston, now Emanuel AME Church on Calhoun Street. Since that day, the AME Church has proven pivotal in South Carolina in matters of faith and social justice. Denmark Vesey was a founding member who led failed slave rebellion that drove the church underground for decades, Darby said. Someone reported the plot to authorities and during the chaos and paranoia that ensued, the church was burned. Congregants slipped underground to worship until 1865 when the church formally reorganized and adopted the name Emanuel. Its white Gothic Revival building on Calhoun Street is the spiritual home to one of the oldest and largest black congregations south of Baltimore and is deeply rooted in the nation’s historic fights for civil rights. Its story, so interwoven with the Holy City’s broader history, begins about 1816 when Morris Brown, a free shoemaker and devout Methodist, walked out of a predominantly white and racially segregated Methodist Church in Charleston, an AME Church website states. Brown formed the African Methodist Episcopal Church of Charleston, now Emanuel AME. Since that day, the AME Church has become pivotal in South Carolina in many matters of faith and social justice. Denmark Vesey, a founding member, led a tragically failed 1822 slave rebellion that drove the church underground for decades, said the Rev. [ sic - Psalm 111:9, KJV ] Joe Darby, presiding elder of the AME Church’s Beaufort District and former longtime pastor of nearby Morris Brown AME. That rebellion was set for June 16, 1822. The shooting happened June 17. After someone reported Vesey’s plot to authorities, the church was burned during the chaos and paranoia that ensued. 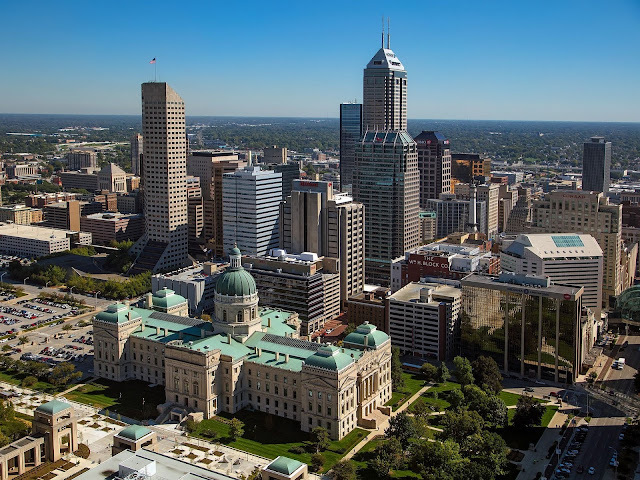 Its members slipped underground to worship more safely until 1865, when the church formally reorganized and adopted the name Emanuel. But late Wednesday, police swarmed the church, with its renowned steeple and elevated entrance, as terrified church members waited at a nearby hotel to learn who had been inside when a shooter opened fire.